The imminent arrival of Soul Calibur VI feels a bit like the return of a long-lost old friend. By the time it comes out, it will have been six years since Soul Calibur V was released, and nearly 20 years since the original Soul Calibur first made the leap from the arcades to Sega’s Dreamcast. Or more than 20 years if you trace the series back to 1996’s Soul Edge for the original PlayStation (known as Soul Blade outside of Japan). So now, Bandai Namco is resurrecting the venerable swordfighting beat-'em-up, and we reckon it isn’t a moment too soon. Happily, we’ve found out quite a lot about it, after an extensive single-player hands-on session, plus an interview with Producer Motohiro Okubo. The most recent trailer was released following Bandai Namco’s showcase of its forthcoming games in late December 2017. Introduced by Producer Motohiro Okubo, it focuses on Sophitia, taking on Mitsurugi (the only two playable characters at the Paris showcase). An older trailer also shows Sophitia and Mitsurugi locked in combat. So far, Bandai Namco hasn’t announced a solid release date for Soul Calibur VI. It has, however, confirmed that the game will arrive during 2018. When we interviewed Producer Motohiro Okubo, he said he was: “Still developing” the game, which points to a likely release date towards the end of 2018. At Bandai-Namco’s December 2017 games showcase in Paris, we were able to enjoy extensive hands-on time with Soul Calibur VI. It was, however, a restricted experience, with only the two-player Vs player-versus-AI modes enabled. The only two playable characters were Sophitia and Mitsurugi, and just two battle arenas were unlocked, both with a distinctly Ancient Greek vibe (even though the game is set in the 16th century). Soul Calibur VI’s gameplay certainly impressed with its fluidity and responsiveness, and it should provide a pleasant nostalgia-trip for those who played previous Soul Calibur games. The main attacks are high, low and middle ones, and the game lets you launch guard moves that must be carefully timed to be effective. Mapped to the bumpers are a slow but unblockable attack (which, we discovered, could be evaded), along with two special attacks known as Critical Edge and Reversal Edge. Reversal Edge is particularly fascinating, as it represents an attempt to level the playing field when novices take on experienced players. As ever in a Soul Calibur game, positioning of your character (via the series’ renowned 8-way-run system) is paramount, but if you get that right and launch a Reversal Edge attack, you trigger what is essentially a rock-paper-scissors-style mini-game, in which you must pick the right attack button-press to get past your opponent’s defence. As with Reversal Edge, Critical Edge attacks can only be unleashed when you build up a meter, and they consist of spectacular, elaborate signature-moves which cause a lot of damage (and can be modified by button-presses after the attack is launched). They, too, can be defended against with a carefully timed guard allied to the appropriate movement, but offer a great means of turning the tide when you’re up against it. As in previous Soul Calibur games, it’s possible to ring-out your opponent (which ends the bout – there’s no moving onto a different arena), and we were pleased to find we could execute a classic Soul Calibur move by jumping out of the arena after winning a bout. Movement of your character is an integral part of the core gameplay: it’s possible to end up facing away from your opponent after you execute a move, so you must remain vigilant as far as your character’s positioning in relation to your opponent is concerned. The first player to win three bouts wins the round. Of the two characters on show, we preferred Sophitia, who is great at close range thanks to the speed of her attacks. Mitsurugi is brawnier, so his attacks carry slightly more weight than Sophitia’s, but he operates best at medium-range and is vulnerable when Sophitia gets in close. Another key element in Soul Calibur VI is destructible armor, which places a premium on the early bouts in a round. If your character takes a beating, bits of their armor will fall off, and the less armor they have, the more damage they will take. Armour cumulatively destructs throughout the course of each round, so if you get hammered in the first bout of a round, that will subsequently hand a slight edge to your opponent. The very restricted nature of the Soul Calibur VI demo we played at Bandai Namco’s Paris showcase, allied to Producer Motohiro Okubo’s refusal to discuss certain aspects of the game in interview, means that feature-wise, plenty of question-marks still hang over Soul Calibur VI’s feature-set. However, here’s what we do know. Firstly, Soul Calibur VI has been constructed using Unreal Engine 4. Graphically, it’s pretty impressive, but we don’t yet know whether 4K versions for the Xbox One X, PS4 Pro and PC will be made – much less available from launch. However, we’d be surprised if they weren’t, in this day and age. The game is set in the 16th century, which means it returns to the era of the first Soul Calibur games – in Soul Calibur V, for example, Sophitia’s children featured as the main characters, but in Soul Calibur VI, she is young again. The number and make-up of the characters also remains mysterious: so far, nine have been confirmed: Geralt of Rivia, Zasalamel, Ivy, Mitsurugi, Sophitia, Kilik, Nightmare, Xianghua, and Grøh. However, the launch screen for Vs battles showed roughly 30 slots for characters, so that is the least amount we can expect. The same applies to the arenas: while we don’t know how many of them will be in the game, they should be plentiful. As more news emerges regarding Soul Calibur’s characters, arenas and modes, we’ll bring it to you here, so watch this space. 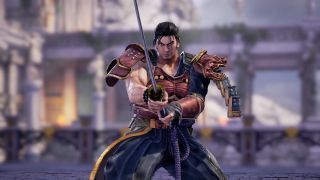 While producer Motohiro Okubo was reluctant to talk about specifics of Soul Calibur VI beyond what could be seen in the Bandai Namco Paris showcase demo, he was happy to talk about his general approach to resurrecting the franchise. Okubo has been at Bandai Namco for 20 years, and VI is his first Soul Calibur game: his last role was Producer of Tekken 7. Okubo said: “At the planning stage, all our project members played all the previous versions of Soul Calibur. We analysed what was fun and how people played them. So I want people to enjoy the same level of fun as previous versions in Soul Calibur VI when it comes to Soul Calibur’s values and culture and the reason why they fight with swords. “What I want to achieve in Soul Calibur VI is, in the battles, to show the meaning and the fun of using swords. In terms of the light movement [fluidity] of the battle, we are trying to achieve the lightness of Soul Calibur II. And the other factor, I think, is the unique fighting system represented by the eight-way run system. It was complete in Soul Calibur V. So in Soul Calibur VI, I want to merge the light movement of Soul Calibur II and the battle system which was complete in Soul Calibur V.
“I feel that, up to Soul Calibur V, the focus became too much about the battle itself, and it became too difficult. So first of all, I’m trying to make it so people who don’t know anything about Reversal Edge or Critical Edge can still enjoy playing with the [attack] buttons. But of course, normally, what happens in fighting is that, if you play with an advanced player as a beginner, you’re just beaten up — badly. Okubo said that, when Bandai Namco began developing Soul Calibur VI, Nintendo’s Switch had not yet emerged, and that while the Project Soul team works to finish the game on Xbox One, PS4 and PC, it hasn’t started working on a Switch version. But he seemed open to the idea of a Switch version, and it would be great to see Soul Calibur VI’s gameplay benefit from some use of the Joy-Con’s motion-sensing capabilities. But if a Switch version does ever emerge, it will surely come much later than the other versions. Previous Soul Calibur games were notable for including guest characters from other franchises – indeed, Soul Calibur IV and V received a certain amount of criticism for becoming too dependent on guest characters. Given Bandai Namco’s existing franchises, it would be a fair bet that iconic characters from Tekken and Dragonball will appear in Soul Calibur VI, either from the start or via downloadable content. But it would be great to see Soul Calibur VI’s guest-character roster include some more out-there selections – like, say, Link (who wields a sword anyway) if the game makes it onto the Switch.